Elsie Langley Winstead, age 92, of Elm City, went home to be with her Lord on Friday, May 12, 2017. Funeral services will be conducted 11:00 a.m. Tuesday, May 16, 2017, at Thomas-Yelverton Funeral Home, Wilson, NC. The Rev. Barry Gardner will officiate. Interment will follow in Cedar Grove Cemetery, Elm City, NC. The family will receive friends from 6:00 until 8:00 p.m. Monday, May 15, 2017, at Thomas-Yelverton Funeral Home, 2704 Nash St. N, Wilson, NC 27896. Born in Wilson County, NC, Elsie was the daughter of the late Dewey and Manila Langley. She married her childhood sweetheart, Earl S. Winstead, who preceded her in death. Elsie worked beside her husband for 50 years, farming the land they dearly loved. She was a faithful member of People’s Chapel FWB Church, where she loved singing in the choir and being a part of the Ladies Auxiliary. 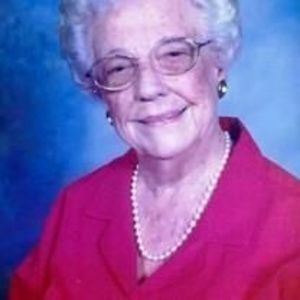 Elsie was a happy person with a wonderful sense of humor. She loved cooking for her family and working in her garden. A special time for her was the time spent with her grandchildren and great-grandchildren who lovingly called her “Nanny”. Elsie was dearly loved and will be greatly missed by her family and many friends. Surviving are her daughter, Joan W. Cotten and husband, Dan of Wilson; a son, Stanley Earl Winstead of Elm City; three granddaughters, Tara Lane and husband, Scott, Stephanie Cotten, and Wendy Neely and husband, Jay; a grandson, Chad Winstead and wife, Kristin; five great-grandchildren, Morgan Lane, Thomas Lane, Landon Neely, Jackson Neely, and Caiden Neely; and one sister, Margaret Gainey of Florence, SC. In lieu of flowers, memorials may be directed to People’s Chapel FWB Church, P.O. Box 234, Elm City, NC 27822.